When I look at my life, I seem to be walking a very thin line between giving up and barely keeping my head above the water. Maybe it is a safety valve You’ve built in to my life to keep in check my tendency to be prideful and selfish. The struggle drives me to You and opens my eyes to other struggling people, giving me the ability to relate to them! 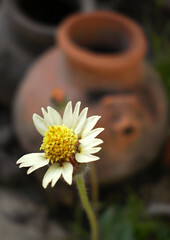 It’s like the story about the cracked pot used to grow flowers along the path. Take my struggle with forgiveness. It’s interesting to note that most bible devotionals I read the past couple of days focused on love, fruits of the spirit etc. The theme touched me a lot and the repeating pattern caught my notice. Father, I need knowledge in Your perspective, so that I may rejoice in what You choose for me. Most of the time, I waste days being discouraged about my circumstances and challenges, when they are really blessings in disguise, given to teach me in Your ways. Thank You for being patient with me when my family and friends acknowledge how difficult it is to love me and live with me. Father, I came across Hebrews 10: 26 – 31 yesterday, which reminded me of the man Christian saw who had lost You in Bunyan’s “Pilgrim’s Progress” and I grew worried. I need to always remember You Father! Thank You for scattering the little reminders through out my day that show me You still love me! Father, forgive me my cracked nature and my forgetfulness and use them for Your work. Just as You are patient with me, help me be patient with the cracked pots and forgetful people in my life and love them like You do. I ask this in the name of Jesus, my Lord and my Savior. Each of us has our own unique flaws. We’re all cracked pots. But if we will allow it, the Lord will use our flaws to grace His Father’s table. In Gods great economy, nothing goes to waste. Don’t be afraid of your flaws.